Masonry of the Cenacle’s eastern wall clearly demonstrates its “layered” history—from the Second Temple period through the Byzantine and Crusader periods to the Ottoman period. Visible on the right is the Dormition Abbey. Photo: Courtesy of David C. Clausen. Even though it suffered numerous natural and man-inflicted disasters and was claimed and successively held by the faithful of all three monotheistic religions, the Last Supper Cenacle remains standing as a testimony to a long-shared sacrality in the Eternal City. It has been a church, a mosque and a synagogue. It was not until quite recently, however, that the location of Jesus’ Last Supper and the identity of this particular building were questioned and became an object of scholarly debate. David Christian Clausen, adjunct lecturer in Religious Studies at the University of North Carolina at Charlotte, examines the evidence for various claims regarding the historical purpose of the Cenacle in his Archaeological Views column “Mount Zion’s Upper Room and Tomb of David” in the January/February 2017 issue of Biblical Archaeology Review. Jesus’ Last Supper and the Tomb of David are traditionally associated with the Cenacle on Mount Zion. Regrettably, no archaeological excavation has ever been attempted at or around the alleged site of Jesus’ Last Supper and the Tomb of David on Mount Zion to assess the development, relationship or even age of the built structures. Only limited probing and non-invasive soundings were performed at different times in history—typically in association with new construction or renovation at the site. 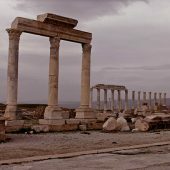 In his latest book,2 Clausen looks at all the extant historical evidence and tries to make sense of what the limited archaeological data tell us when interpreted together with contemporary artistic representations, literary sources, accounts by Western pilgrims and the various traditions passed on through the ages. In unraveling the complex story, Clausen tackles two sets of issues: First, when was the building we now call the Cenacle established, and what were its functions over the centuries? Second, where are the actual sites of Jesus’ Last Supper and the Tomb of David? 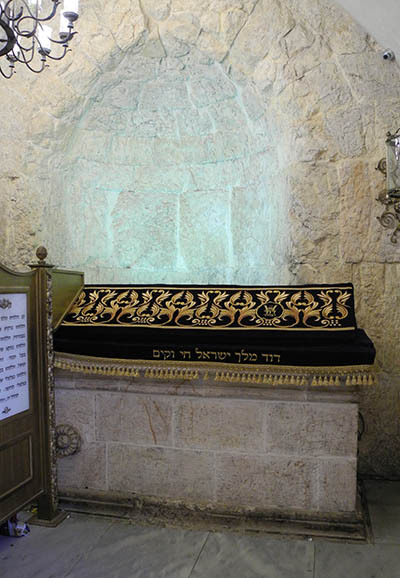 The presumptive Tomb of David is commemorated in the Cenacle on Mount Zion by this cenotaph. The niche visible behind the cenotaph is seen by some as evidence for the space having been a synagogue in antiquity. Photo: Courtesy of David C. Clausen. Biblical texts locate the Tomb of David in the City of David, the ancient settlement overlooking the Kidron Valley (1 Kings 2:10 and Nehemiah 3:14–16). It was apparently only in the Middle Ages that the burial place of King David began to be expressly associated with Mount Zion. Adding to the puzzle, however, is the uncertain location of the Biblical Zion vs. the modern-day Mount Zion. Can we safely identify the Biblical Zion with the western hill we now call Mount Zion? Where Jesus’ Last Supper took place as narrated in the Gospels is even more intricate. Unlike with the tomb of David, the location of the Last Supper’s cenacle is not specified in the Bible.4 Nor is the location of a number of other events associated with the same building clear, including appearances by the risen Jesus (Luke 24:36; John 20:19–29), the selection of Matthias the twelfth apostle (Acts 1:26), the first Pentecost following Easter Sunday (Acts 2:1–14), and the interment of Jesus’ brother James. And literary sources, such as the anonymous pilgrim from Bordeaux and Egeria who associate the location of Jesus’ Last Supper with Mount Zion, go back only to the fourth century C.E. As the alleged place of congregation and worship for early Christians in Jerusalem, the Cenacle on Mount Zion would be the first Christian church ever.5 So, did subsequent churches at the site of today’s Cenacle honor the location of the original Upper Room? Was the Byzantine basilica of Hagia Sion (“Holy Zion”)—built in 379–381 C.E. and demolished in 1009 C.E.—constructed to incorporate the house where Jesus’ Last Supper happened? 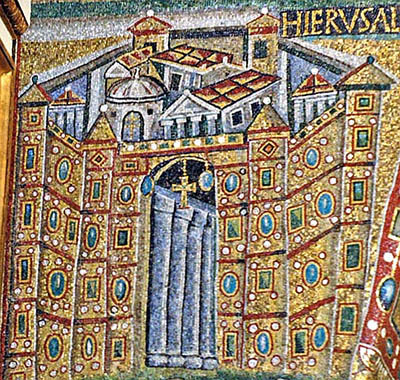 Called “the mother of all churches,” the Hagia Sion might have been, but the sixth-century mosaics of Jerusalem from Santa Maria Maggiore in Rome and St. George Church in Madaba, Jordan, which are the two earliest artistic representations of the basilica, do not support this opinion, but rather show an autonomous structure standing to the south of the Holy Zion Church. This sixth-century C.E. mosaic map of Jerusalem from the Church of St. George in Madaba, Jordan, shows the large Byzantine basilica on Mount Zion with a small building next to it (encircled), which might be the building traditionally identified as the “Upper Room” of Jesus’ Last Supper and the Tomb of David. Next, what is the relationship of the earliest architectural stages of the Cenacle to the Crusader-period Church of Virgin Mary and to the modern Dormition Abbey and the Basilica of the Assumption (or Dormition), built in the early 1900s over the western end of the Byzantine-era Hagia Sion? A mosaic in the Santa Maria Maggiore Church in Rome depicts a large basilica on Mount Zion flanked by a small building—the cenacle of Jesus’ Last Supper and the Tomb of David? Photo: Courtesy of David C. Clausen. But, most fundamentally: Do the Cenacle’s origins actually date back to Jesus’ time? Without new hard evidence—such as from excavations—this is impossible to tell for sure. Did other Biblical events traditionally associated with this building really take place at the same spot? We might never know. Re-used in this medieval, Islamic-period dome inside the Cenacle is a Crusader-era column capital with carved eagles and other Christian symbols. Photo: Courtesy of David C. Clausen. Some scholars, including Amit Reem of the Israel Antiquities Authority, maintain that the structures detected under the Cenacle are nothing more than just remains of a late-fourth-century Byzantine church, the Holy Zion basilica. Clausen, however, asserts that the Cenacle’s oldest elements did originate before the Byzantine period. To learn Clausen’s full argument, read his Archaeological Views column “Mount Zion’s Upper Room and Tomb of David” in the January/February 2017 issue of Biblical Archaeology Review. Subscribers: Read the full Archaeological Views column “Mount Zion’s Upper Room and Tomb of David” by David Christian Clausen in the January/February 2017 issue of Biblical Archaeology Review. 1. “Room upstairs” in the opening quote from Luke’s gospel corresponds in the original Greek text to the word anagaion, which denotes any upper-floor room (or elevated part) of the house. In Luke’s gospel, it serves as a dining-room (hence the Latin coenaculum). 2. David Christian Clausen, The Upper Room and Tomb of David: The History, Art and Archaeology of the Cenacle on Mount Zion (Jefferson, NC: McFarland, 2016). 3. 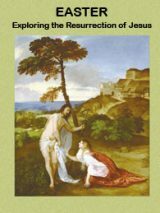 See Jeffrey R. Zorn, “Is T1 David’s Tomb?” BAR, November/December 2012. 4. See Matthew 26:17–20; Mark 14:12–17; Luke 22:7–12. 5. See Bargil Pixner, “Church of the Apostles Found on Mt. Zion,” BAR, May/June 1990. 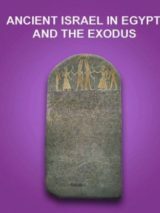 This Bible History Daily feature was originally published on February 9, 2017. During the excavations done by the Redmond wile in 1906 for the Rothschild Foundation, in the southern spur of the City of David which is build on the true Mount Zion above the Gichon spring of the Garden of Eden the Seating Upper Room in a synagogue stile was unearthed. Within the deferment artifacts a Written Stone in Greek was found telling the same story as found in Luck 22. The real City of David use to be above the Gichon Spring until King Manasseh the wicked Baal worship son of King Hezekiah. he moved the palace from Mount Moriyah = mount Zion, to the high Western hill as all the Baal worshiper use to do. blessings, nice information. but God’s temple was located in the City of David, not the temple mount. temple mount is the original Roman Fort Antonio. The profound and,as yet,only partially revealed theological-historical content of The Last Supper is infinitely more important than its’ supposed location. I believe that this belief started due to a textual association of the Upper room with David in Acts 2:29. Peter says David “both died and was buried, and his tome is with us to this day.” (NRSV) I believe that Peter was speaking figuratively, but perhaps early Christians reading this passage believed that David’s tome and the Upper Room were one and the same. Sometimes obvious things are hidden to the eyes of people who are supposed to know jewish customs… there is no way to have a building on top of a jewish tomb… more so over David’s tomb. So the place for Yeshua’s last supper could not be associated to David’s tomb. David was buried in the valley of the Kings below in the area of the spur, as no doubt his son King Solomon was, though his tomb has no cenotaph near Davids.. This site is just another spurious, and unproven holy site. I imagine Jesus could have celebrated the feats of Tabernacles, with which the Triumphal Entry and cries of Hoshanna are closely linked to. The room in the greek described as Estronemon, which means covered over no doubt alluded to the Succah covered with the palm fronds which are not in gree bloom and bushiness during this season anymore then the shepherd were out on Dec 25 when anyone who knows Jersualems whether would have frozen to death in a matter of hours. Jesus last meal could have been anywhere. Maybe here maybe there, in the house of a believer or supporter where he would be assured discretion. The caption of one of the photos reads: “Re-used in this medieval, Islamic-period dome inside the Cenacle is a Crusader-era column capital with carved eagles and other Christian symbols. Photo: Courtesy of David C. Clausen.”. I beg to differ. It has the symbol of the Eucharist (A mother pelican wounds her chest to feed two of her young with her blood) over its four faces, extremely well preserved. It astounded me how such a direct reference to the supposed character of the Cenacle was respected after the islamic recapture of the city.